BeeQuipment South Africa is owned and run by Mike Miles, a registered beekeeper, based in Johannesburg, Gauteng. He started keeping bees at the age of 15 with a beehive in his garden in Salisbury, Rhodesia. 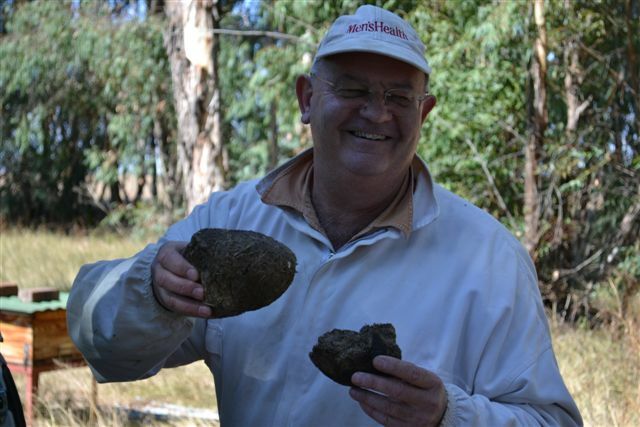 When he relocated back to South Africa, being South African born, in 1982 he continued with his hobby whilst working on the mines down in the Free State. After moving up to Johannesburg he discontinued beekeeping activities for a number of years but resumed his hobby interests in 2000 and today runs ± 70 beehives in and around the Johannesburg suburban areas and on a number of farm sites in the Magaliesburg and Mooi Nooi districts. Elephant dung is certainly the best form of smoker fuel – but smoking it does things to you!! BeeQuipment was started in 2007 by Mike given the lack of available beekeeping equipment outlets in the northern suburbs of Johannesburg. Initially the business focused on beehives but with the growing interest in beekeeping as a hobby by suburbanites and people living on plots and smallholdings, our Beekeeping Outlet has grown into offering the full range of equipment which any hobbyist or small scale beekeeper would need. In addition to standard Langstroth beehives, and Trap Hives (and Top Bar Hives) we also stock the full range of Protective Clothing, Accessories and Tools for beekeeping, beeswax foundation sheets for frames, and publications on practical beekeeping for South African conditions, and trinkets and gifts. A particular speciality of our business is Honey Extraction equipment. Beequipment retails locally made stainless steel honey extractors, both manual and motorised in 6 frame and 12 frame models. We are the only beekeeping outlet which sells South African manufactured honey extractors on a commercial basis. In addition, given his contacts in the South African manufacturing sector where he works with a number of clients in his consulting practice, Beequipment is able to retail locally made products unique to the South African beekeeping sector’s needs. He has designed a food product, Booster Bee, in conjunction with a large reputable food manufacturing outlet in Johannesburg which has resulted in both nectar and a pollen nutritional substitute feed for honeybees for African conditions. As a result of the growing interest in beekeeping in South Africa, and particularly in the Gauteng Province, the demand for a practical introductory course on beekeeping has lead Mike to design and run, on a regular monthly basis during the summer season, a Basics in Beekeeping weekend training course. Mike Miles assisted in building up and promoting the activities of the Johannesburg based Southerns Beekeeping Association www.beekeepers.co.za over the past number of years. He is currently the Chairman of SABIO, the South African Bee Industry Organisation, the national body of beekeepers in South Africa. In addition, given his legal background and main line of business, he has been instrumental in drafting changes to the national statutory legislation on Control Measures in beekeeping in South Africa in conjunction with the Department of Agriculture, Forestry and Fisheries. He is also assisting with the drafting of national legislation on a fully comprehensive Beekeeping Act. The Administration, Orders and Sales of BeeQuipment is in the capable hands of Doreen who assists Mike in the daily running of the business. The outlet is based at Mike’s suburban residential home in Randpark Ridge, Johannesburg. Prior arrangement to visit our premises is essential to ensure that someone is available to assist with enquiries and sales. 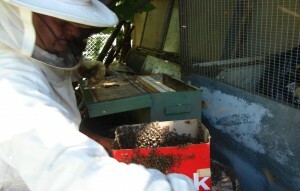 Although relocating bees from unwanted sites into beehives is not one of our core services, when carrying out this essential task every caution is taken not to harm the bees.